It’s official — the Atlantic 10 is a 2 bid league. Normally, this isn’t much to brag about, but in one of the worst non-conference showings for the league as a whole in a long time, we will take it. For anyone who missed this year’s Selection Show, it was one of the smoothest bracket reveals CBS has had in years — props to those guys for finally getting it right. Even better for A-10 fans, there was no anxiety after the first few minutes. VCU was the 2nd team announced: an 8 seed in the East region with a first round matchup against #9 UCF. Just a few seconds later, Saint Louis was announced in the same region as a 13 seed facing #4 Virginia Tech out of the ACC. Both teams have their work cut out for them in the first round, but these draws definitely could have been worse. For one, an 8 seed seems pretty generous for VCU. The Rams were toying with the 7 or 8 line in most bracket predictions prior to the start of the A-10 Tournament. Then, the Rams went down in the first round to Rhode Island and saw their star player, Marcus Evans, leave the game after an injury. The Rams fell to “Last 4 Bye” status in one of Joe Lunardi’s final projections, but the Selection Committee treated the Rams well with a great contest against a UCF team that’s very comparable in talent. Saint Louis grabbed a 13 seed, which isn’t unreasonable at all. The Billikens could’ve honestly been on the 14 line as they head into the NCAA Tournament outside of Kenpom’s top 100. Virginia Tech isn’t an awful 4 seed to have to face either, but beating the Hokies would be a major upset for Travis Ford’s bunch this Friday. This was kind of crazy to me, but if you compare Saint Louis and UCF in Kenpom, their profiles look very similar, which means VCU will be matching up against an opponent that’s similar to one it beat at home during the regular season. UCF plays great defense (ranks 13th nationally in defensive effective field goal %); it doesn’t force a lot of turnovers, but it’s very effective at limiting teams from behind the three point line and even more so at defending in the paint. This has a little bit to do with a 7’6″ dude named Tacko Fall who blocks shots with ease. Another note (and where the SLU comparison really gets driven home) is that UCF is a pretty poor free throw shooting team. 333rd nationally from the line really stands out. However, a lot of this stat is weighted down by Tacko Fall who has shot just 36.1% from the line on 158 free throw attempts this season (that’s not good). 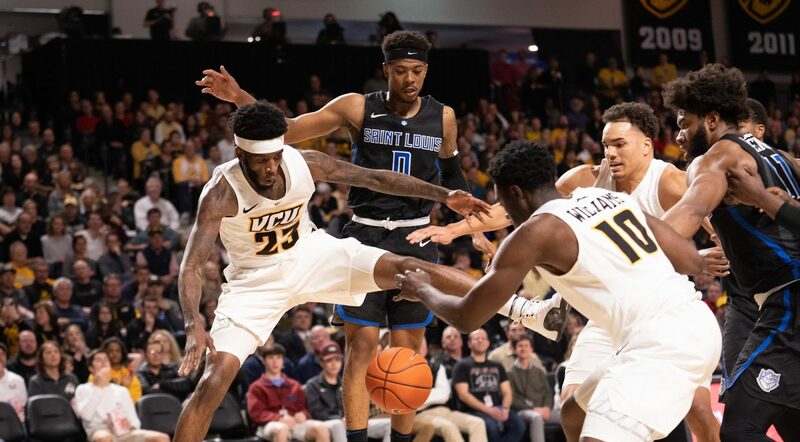 There definitely is a Saint Louis comparison worth making here, but the Knights will be a tougher out for VCU than the Billikens. UCF is solid from three point range thanks to Aubrey Dawkins who’s shooting 39.2% from range on the season and 42.3% in conference play. This is also a very tall team, one that ranks 8th in the nation in average height. In comparison, VCU is 87th, but if you can neutralize Tacko Fall (again, he’s 7’6″), there’s really no advantage for the Knights in that regard. As I noted, VCU is going to have the advantage at the charity stripe, as the Knights are not great from the free throw line, and the fewer minutes Tacko Fall plays, the better. Fall has the nation’s best effective field goal percentage this year, making more than 3/4 of his shots. Obviously when he catches the ball in the post or gets close enough to the basket, there’s little you can do to defend him other than foul. Luckily for VCU, its bench runs deep and can afford to dip into the reserves if it becomes a hack-a-Tacko fest in Columbia. Worth noting as well — having Marcus Evans back for this game will be huge. He had the 4th best free throw rate in the Atlantic 10 conference this season, meaning he’s very good at getting to the line. Evans ranked 1st in the conference in fouls drawn per 40 minutes while Marcus Santos-Silva ranked 3rd in the same metric. I can’t stress how enormous this key is: in particular, if you can attack Tacko, force him to the bench in foul trouble, and accumulate easy points at the line in the process, VCU will have the advantage in this first round contest. Speaking of Marcus Santos-Silva, he’s going to have to have a big game yet again. With 26 points and 22 rebounds in an opening round loss in the A-10 Tournament, MSS had the best game of his career. He was physical, and he grabbed every single rebound that he got a finger on. His play in the post against Fall will dictate how this game goes. VCU can win this game if it plays to its identity. Make this UCF team uncomfortable. Attack them in the lane, forcing them to foul. Don’t settle too much for the three. Force turnovers and do whatever it takes to eliminate the height advantage that Tacko Fall brings. 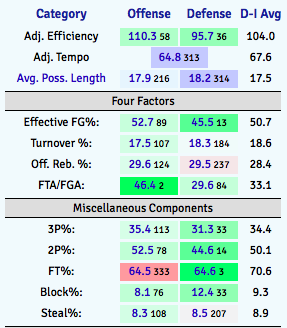 I like VCU’s chances of coming away with a victory, and a healthy Marcus Evans is going to be an enormous reason why. Let’s be honest: three point shooting is going to be a huge discrepancy in this Saint Louis vs. Virginia Tech game. The Hokies are firing at a 39.4% clip as a team from long range (8th nationally) while the Billikens are shooting just 30.8% (327th nationally). That can’t be the story of the game for Saint Louis — the Billikens have to force Virginia Tech to play to the style Travis Ford likes: physical, scrappy, and defense-minded. It’s worth noting that Saint Louis has 32nd best perimeter defense nationally in terms of opponent field goal percentage from long range; however, the Hokies have 6 guys who shoot better than 35% from three. Saint Louis has none. Again, the Billikens want to run Virginia Tech off the three point line as much as possible. Force their guards to make contested lay-ups over Hasahn French and D.J. Foreman who will be protecting the paint. The upset bid is going to be tough, but Hasahn French is going to have to spearhead it in my opinion, particularly on the defensive end of the floor. Virginia Tech’s 2nd leading scorer and leading rebounder is named Kerry Blackshear, and at 6’10”, 250 pounds, he’s a force to be reckoned with in the paint. He’s solid from the field and is a great free throw shooter. The combination of Hasahn French and D.J. Foreman will have to shut him down in the post and use their physicality to outmuscle a very good big man from the Atlantic Coast Conference. On the other end of the floor, I look for Saint Louis to take advantage through Hasahn French and Jordan Goodwin on the offensive glass. The Hokies are a so-so rebounding team on the defensive end of the floor, so 2nd chance opportunities will be absolutely pivotal. Crash the glass, and get some buckets in the paint, and Saint Louis will have a better shot at pulling the upset over the 4 seed. This is a matchup I can’t wait for: Saint Louis’ Tramaine Isabell against Virginia Tech’s Nickeil Alexander-Walker. The former has been red hot lately, winning the Atlantic 10 Tournament Most Outstanding Player accolade; he also has a 39 point performance in the rearview on senior night over Duquesne. The latter is an incredible player. He leads the Hokies in scoring at 16.6 points per game, is a proven three point shooter, and is a tough player to guard at 6’5″. Offensively, Tramaine Isabell will have to go bucket-for-bucket (and then some) with the Hokies’ stud sophomore if the Billikens want a chance. On the defensive end of the floor, I could see DPOY Javon Bess getting the assignment on Alexander-Walker, though another deadly scorer Justin Robinson is expected to return to Virginia Tech’s starting lineup for the NCAA Tournament; he has missed the last few weeks with a foot injury. Robinson might be rusty or playing limited minutes for the Hokies, but he’s another dangerous guard that you have to account for on the court. Bottom line: Saint Louis is going to need every ounce of defense Javon Bess can offer on Friday night. As a matter of fact, that goes for the rest of the team too. This is honestly an interesting game. If I’m Saint Louis, I obviously want this thing in the 50s — hell, maybe even the 40s. Saint Louis needs to go to its bread and butter (defense) to slow down an incredibly efficient offense. Unfortunately for them, Virginia Tech is well-versed on the defensive end of the floor as well, so buckets are going to be hard to come by for Saint Louis. It’s going to take some March Magic for Saint Louis to pull this one out — let’s see how things go.